The legendary Dinamo Kyiv side marshalled by Valeriy Lobanovskyi was widely viewed as a precise, scientific machine with clearly-defined roles. But there was one spark that stood out amidst the regiment: Oleh Blokhin. Lobanovskyi famously shouted at his players, “Don’t think! I do the thinking for you. Play!” Blokhin could certainly play, like few others, but he may well have chosen not to had he followed in his mother’s footsteps and become an athlete. With good reason; it was rumoured he was even faster than the legendary sprinter and 1972 100m gold medallist Valeri Borzov. More than just a physical masterpiece, there was little doubt Blokhin could think too; his lightning pace and lethal finishing on the pitch were mere components that made the player, but what made the man was his sharpness of mind. He combined the two in order to break almost every record within his reach: highest Dinamo Kyiv goalscorer of all time, highest Soviet League goalscorer, highest scorer for the Soviet Union, most capped Soviet international, first Ukrainian to be awarded the Ballon d’Or, most Soviet Higher League titles. Blokhin’s CV stretches on almost beyond the horizon. In 1975 he was named the best player in Europe after a spectacular season brought Lobanovskyi’s side Cup Winners’ Cup glory, but it was against the great Bayern Munich side of Franz Beckenbauer, Sepp Maier, Karl-Heinz Rumminegge and Gerd Müller that he conjured perhaps his most spectacular moment. In the first leg of the European Super Cup in Munich, a Bayern attack broke down just outside of the Dinamo penalty area. As the ball was played to Blokhin, well inside his own half, only one thought crossed his mind as he glided forward into space. He carried the ball over halfway, burning Georg Schwarzenbeck, and looked up for assistance. But still he lacked supporting teammates, so he continued alone. By the time he cut inside on the edge of the penalty area, the Bayern defence had regrouped but Blokhin simply swerved through them, with a grace that told you it was all planned already in his mind, dancing past the statuesque Beckenbauer and sliding a tidy finish past Maier. Such eloquence and creative courage didn’t go unnoticed, even in the closed world of the Soviet Union. Players were officially permitted to leave only once they reached the age of 29 but it didn’t stop Real Madrid sniffing around Kyiv’s finest. 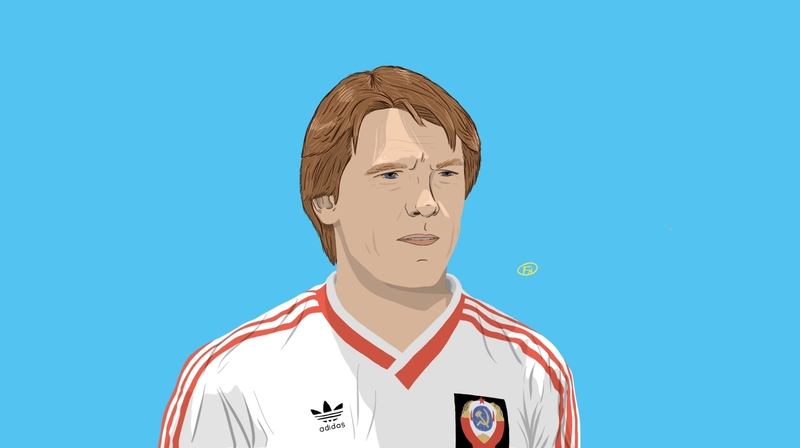 Despite two previous rebuffed attempts, in 1981 they came within a whisker of bringing Blokhin to the Spanish capital with an offer of a coaching role after his playing days had finished. Terms were reportedly agreed but, at the last minute, the Soviet authorities got cold feet about allowing their star man to leave at a crucial stage of World Cup qualification and at home he remained. When he finally made the move to Europe, seven years later, his destination was decidedly less glamorous. By now well past his best, he arrived in Austria after almost two decades at Dinamo – still two years before the Soviet Union collapsed – to play for newly promoted Vorwärts Steyr, who just over a decade later were playing in the eighth tier having been declared bankrupt. It showed a certain individuality in breaking away from his home country, even if he was 36 and facing the end of his career.